National Mentoring Month, just celebrated in January, is a reminder to think about the significance of mentoring relationships and the many forms mentoring takes. At Urban Initiatives, mentoring plays a powerful role in everything we do. Many people might typically think of mentoring as the relationship between an older, wiser individual who provides life advice and a listening ear to someone younger in their life journey. However, in our sports-based youth development programs, mentoring takes on a more dynamic and fluid shape. 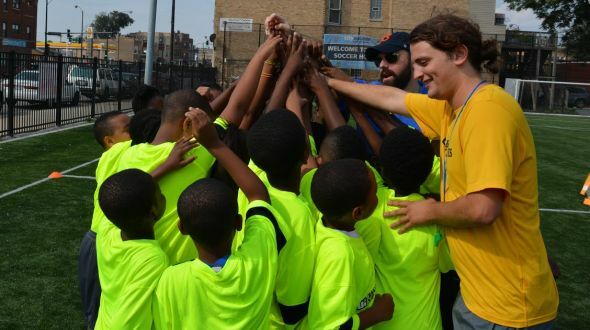 At the foundation of the success of Urban Initiatives’ work are highly-motivated, well-trained, and relationally intelligent youth development coaches who use the structure of sports and play to draw out the life value of teachable moments. The time and effort put in by Urban Initiatives’ coaches identifying and unpacking these teachable moments with students becomes just one important component of the strong mentoring relationships that develop through Urban Initiatives programming. Whether it’s the soccer coaches and K-4th graders of the Work to Play program, the Program Associates and the 5th-8th graders of the Take the Lead program, or the Recess Coordinators and the entire K-8 school population in the Play with Potential program, Urban Initiatives has seen thousands of mentoring relationships develop between our staff and students. The stories of support and care are endless as Urban Initiatives coaches take on all sorts of roles, from friends who take kids to a Cubs or Bulls games to tutors who put in extra hours to help pull grades up. However, the most important thing about Urban Initiatives mentoring relationships is that they are a two-way street of dialogue and learning. Urban Initiatives coaches love the roles they find themselves in because they are often challenged and supported in their own thinking and learning by the questions and statements of students of every age. It is the goal of Urban Initiatives coaches not just to be a mentor but to teach and train students to be mentors themselves, no matter how old they are and no matter the age of those they mentor. The Urban Initiatives team is proud and grateful to state that we have learned just as much from our students as we have taught them. As coaches, we talk about and model teamwork, respect, commitment, self-esteem, and healthy living day in and day out, but our students and players also teach us new ways to live out those values in each and every situation. Now that we are in February and National Mentoring Month has ended, Urban Initiatives would like to challenge you to continue to think about the enormous value of supporting a mentoring organization and being a mentor yourself. Let’s not confine our passion for mentoring to just one month, but rather, let’s take advantage of every moment that this year affords us to make a difference in the lives of the next generation by being powerful, mentoring adults who listen and learn from the students we are privileged to know.